No matter what sized construction job you are undertaking, there will be some waste involved. In fact, waste removal is a big part of the construction industry as a whole. If you have an upcoming construction job, you need to start thinking about how you are going to get rid of your unwanted waste. Today we are going to learn some tips that will help you choose the right construction dumpster for your job site. Construction dumpster rental doesn’t have to be a difficult task if you know which type you need. The size of your construction job will determine the size of the construction dumpster you will need. Construction dumpster sizes range from 20 yards, 30 yards, and 40 yards. A typical residential remodeling job can be handled by a 20-yard dumpster while building an entire house you will need a 40-yard construction debris dumpster. Roll-off dumpster is easy to put into place and can be quickly picked up, and removed when they are full. So make sure to request a roll-off dumpster when contacting your construction dumpster rental service. 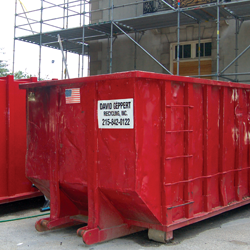 There will be several fees that you will need to consider when renting a dumpster for your construction job. First, there will be an initial cost of renting the dumpster then you will have to pay local and state sales tax. Depending on the company you choose, there may also be a small delivery fee. Prices of dumpster can range widely from one rental company to the next. So make sure to shop around before making a final decision on which company to choose. You just might be able to save yourself a lot of money by doing so. You will need to consider which types of building waste you will need to dispose of. Hazardous waste such as asbestos should not be thrown into a construction dumpster and will need to be handled professionally. Also, avoid throwing any flammable items into a normal open faced dumpster. There are more ways than one that a dumpster rental in Philadelphia can help you as a homeowner. Most of the time, a homeowner would require a dumpster rental during major house remodeling or renovation projects to dispose of waste, however, services may also be hired to transport other items as well. 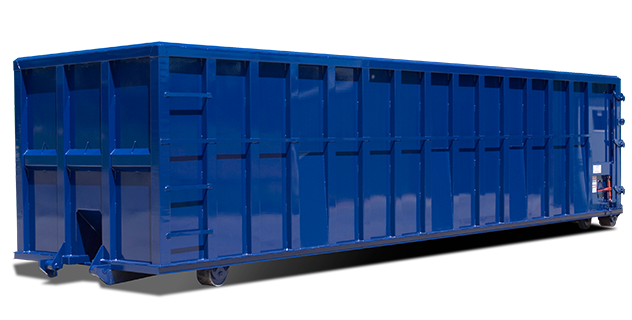 It is great to know that it is fairly easy to book a dumpster rental in Philadelphia, and it is more affordable than you think it is. Most of the time, the contractor you will be hiring when remodeling or renovating your home will already give you a package deal including transportation of waste. However, you can also do your own research and you would be surprised how some dumpster rental companies can offer more affordable prices that would allow you to save money that you can use instead to beautify your new home even more. Booking a dumpster rental in Philadelphia is fairly easy. Most companies offer 10, 20, 30 or 40-yard rental dumpsters, and you would first need to determine how much waste you would need to dispose of and which dumpster size you would need. It is important to note though that you cannot fill up a dumpster more than its capacity. As a matter of fact, most dumpster rental companies would recommend for you to just fill each dumpster up to 75% of its capacity as the truck needs to be covered prior to transporting the waste to a landfill. If you are unsure of the dumpster size you would need, it would be best to rent a larger one than what you are initially planning as this can save you money should you have underestimated the waste and you would need to rent two trucks. You would also need to inform the company on what kind of waste you will be disposing for them to know which landfill to take the waste to. In most cases, you would need to secure a permit from the Philadelphia city office should the container need to be parked on the street. Aside from house remodeling and renovations, a dumpster rental may also be hired if you need to dispose of too many items in your home. While you could have already held a garage sale for some of the useful items you want to get rid of, there will still be some that you need to dispose. Though you may probably donate these items to shelters and other charity institutions, some things just wouldn’t be useful anymore, hence the need for a dumpster rental in Philadelphia. Most dumpster rental companies will offer you a free price quote depending on your needs. It is good to know though that a dumpster rental in Philadelphia is ready to provide you with great services with great prices. Call Geppert Recycling today at 215-842-0122 for a fast and free quote for all your dumpster rental needs. Are you looking for the best company for dumpster rental in Philadelphia? Making the right decision may not be an easy task, especially for those who are doing so for the first time. The choices can be overwhelming, and lack of proper knowledge can lead to making an choice that you may regret. The rest of this post briefly tackles some of the things that you should know about dumpster rental, which will increase the likelihood of making the right choices. There are many reasons on why you might consider the possibility of dumpster rental. From small-scale projects that you can complete on your own to the larger ones that require more expertise, a dumpster can prove to be useful. You might need it when cleaning the basement or attic, remodeling a bathroom, replacing windows, disposing waste from the backyard, or commercial construction, among others. When it comes to dumpster rental in Philadelphia, one of the most important things to consider would be the right size. In this case, the size of the dumpster will be based on cubic yardage. For smaller projects, such as cleaning the garage, a 10-yard dumpster usually proves to be sufficient. For large projects such as commercial sites, a 40-yard dumpster will be a perfect choice. The best way to make the right choice would be to call one of our professionals at 215-842-0122. It is important to work only with a trusted name for dumpster rental in Philadelphia, which will provide you with the assurance of its safety. The dumpsters should be made from excellent materials and must be able to withstand the demands of the job. More so, keep in mind that you cannot just dump any material in the dumpster. Make sure to prevent dumping tires, batteries, corrosive chemicals, and flammable substances, among others. Place the dumpster in the right location as well during the project to ensure its safe use. It should be placed on a hard surface, and there should also be layers of wood beneath to avoid having concrete markings at the end of using the dumpster. There are some seasons where the demand for dumpster rental is significantly higher. Call us today to discuss your dumpster needs. We are professionals in the dumpster business and we can help you make the right choices to ensure the most economical and safest outcome to your dumpster rental needs. Where do I rent a Dumpster in Philadelphia? Looking to get rid of the unwanted items you keep having to look at either in your home or office? Looking for a solution with disposal and recycling services… you have come to the right place. David Geppert Recycling is a trusted dumpster rental company and recycling facility in Philadelphia that is family owned and operated, and has been providing great service to the Philadelphia Tri-State area since 1992. Geppert provides waste removal services with the utmost integrity, highest quality service, fast delivery, and the lowest rates. For prompt service & reasonable rates let Geppert Recycling handle your waste disposal needs. 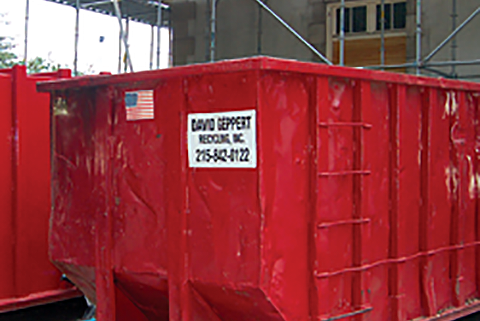 Geppert has been providing the Philadelphia area with dumpster rental service and waste disposal for over 20 years and offers the largest variety of dumpster sizes available in Philadelphia, Montgomery County, Bucks County, Chester County, and Delaware counting; as well as select areas in New Jersey and Delaware. Call Geppert at 215-842-0122 today to rent your roll off dumpster today!